It's funny how much my tastes have changed in just over a year of being passionately interested in polish. I was never a full-on "muggle", but my polish palate was unrefined. I don't know anything about wine, so I'll probably sound like an idiot here, but in those terms I was all about Bordeaux and port back then and winced at even the suggestion of anything else. In the past year's swatching (Monday will be a year since I posted this.) I've dabbled a lot, trying out finishes and colors that I never would have glanced at before. I've even adored a few I'd actually crinkled my nose at in the past. Along the way I've fallen in love so many times and expanded my views on color and finish without ever losing my delight in the most "me" polishes. Today's swatches are the perfect blend of who I am now and who I've always been. Trying out brights, pastels, etc. was fun...but fall will always be my season. It's great to be "home" again and my fall Zoya picks from the Camo promos (Tomoko and four Cashmeres) were the best possible kickoff for my favorite time of year. 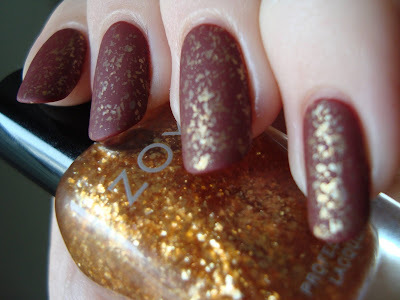 Today I'm rounding that out, saving the very best for last...but starting off today's post with my favorite of this fall's Zoyas. Maria-Luisa is a warm gold mylar flakie top coat. *deep, happy sigh* This is what I mean. Early last year I could never have believed I'd love a neutral cream with a gold flakie accent so much that I'd show it off twice. I'm not even sorry. I am so smitten with Flynn and Maria-Luisa and I want the whole world to know it! Maria-Luisa applies like a dream. Dense, smooth, autumnal and it's just outstanding. One coat is all you need as a topper, no dabbing required. I loved the accent so much that I had to extend it to the rest of my nails. ...mattify it and love it all over again! I think I'll be wearing this combo a lot. It's work-appropriate and versatile. I love all three looks just too much! That's just the beginning though. Gold goes with so many colors. Over a rich red it's bolder and has an almost regal look to it. I felt like a Faberge egg. So sumptuous. I had to mattify this combo too. Mattified, it changes once again. Antique gilded leather! I want to put Maria-Luisa over EVERYTHING, but just one more combo for now. I don't think I'll ever get over Maria-Luisa! I may need a second bottle. There's a comparison at the bottom to show exactly why I love it so much. 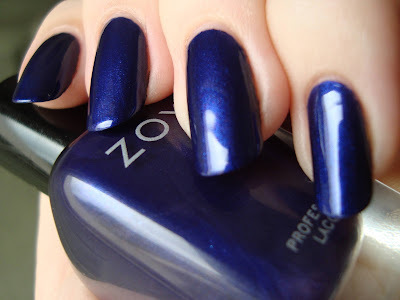 Neve is a deep indigo with a metallic shimmer finish. Neve is one of those in-between "blurples" that are impossible to photograph. My skin looks a little odd in these photos. I sacrificed a bit of personal vanity for polish color-accuracy. Not perfect, but pretty close. The super-dense metallic shimmer makes Neve look purple in the bottle, but there's a sulfur whiff that confirms a blue base. The formula's great, almost a one-coater. It's smooth and thick and doesn't get brush-strokey like I worried it might. I adore the finish. I've always been a sucker for metallic shimmers. I mattified Neve too, but getting a really accurate photo just didn't seem possible. It mattified beautifully, with a soft glow where the light hit it and night sky depth at the edges. It's bluer mattified, but not quite as blue as my photo. Claudine is a deep gray metallic shimmer with green and brown undertones. I need to clarify something right off the bat. Claudine isn't green! I've seen swatches that suggest it is much greener than it ever even started to look on me. The color is really interesting, so I can't say I'm disappointed, but it's decidedly gray with just moments and suggestions of olive. 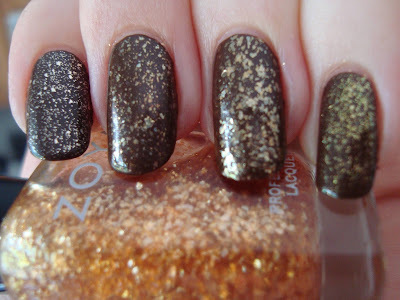 Great formula here too, two coats and no strokey mess like a lot of metallic shimmers. Something about the finish clashed a bit with my cleanup technique for some reason, leaving slightly ragged edges on some nails. It bothers me a little, but it's barely noticeable in person. Someone with a different technique probably wouldn't have this issue. Claudine got a dose of matte top coat too (I'm loving OPI's Matte Top Coat, by the way) and the result is an awesome oiled bronze look. And now the comparisons! I don't have anything quite like Claudine, but I stacked Maria-Luisa up against some of my other gold flakies and tried Neve next to OPI Russian Navy. My other gold flakies include NYX Beige Glitter, Essie As Gold As It Gets, and Sally Hansen Gilded Lily. I have a couple others, but they're near-dupes of the ones I used. See why I'm so nuts over Maria-Luisa? It's the boldest, goldest gold flakie I have, by far! 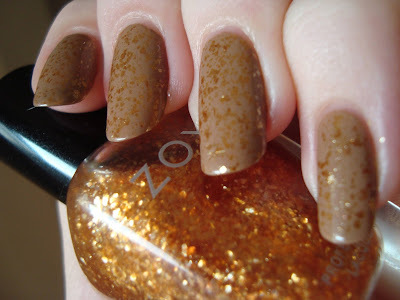 Beige Glitter has a tinted base (so does its sister, Creme Glitter), so it changes the look of Louise. It's also got much smaller and thicker pale gold flakes. They're almost tiny shards. As Gold As It Gets is slightly softer in color and not as dense. Gilded Lily and its near-dupe OPI Goldeneye are denser than Maria-Luisa, with much smaller microfleck in a very brassy gold. Maria-Luisa is absolutely my favorite of the bunch as a top coat. I thought Neve would turn out to be much closer to OPI Russian Navy than it wound up being. Neve looks a bit bluer here than in person, but not much. 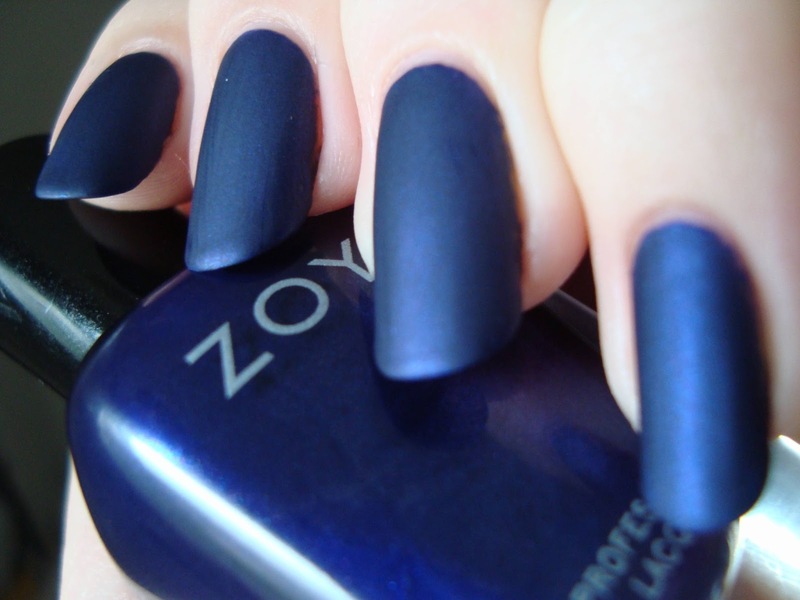 Russian Navy is considerably darker and more purple. 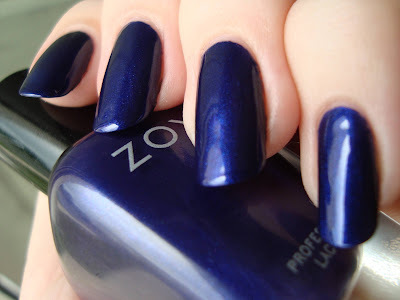 The red shimmer also pops more strongly in Russian Navy. I like them both and they're not dupes at all, more like sisters. Bottom line: You need Maria-Luisa! Need. Just....need. I think I need a backup bottle. I love it! Neve and Claudine apply drastically better than most metallic shimmers. Claudine's got a touch of olive to it, but only a touch. It's not green! I like all three, but Maria-Luisa is outright essential. I don't say that very often. 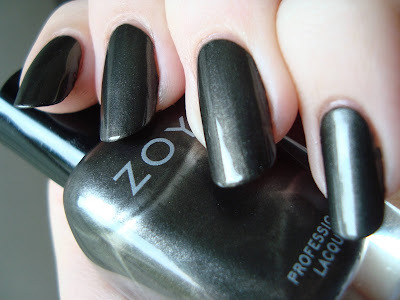 My Zoya picks were a great way to step back into my comfort zone and I've got a ton of other fall stuff to show you soon...and even more on my shopping list. I've also got a non-polish review coming next week. I'm gonna show a little bit of leg. See you then! I love the gold flakie color! 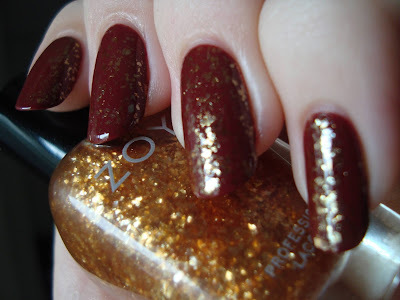 My issue with Zoya polish is that it takes FOREVER to dry! Do you have that issue?